VarioConnect is the new Braille display available with 24, 32 or 40 Braille cells. Cursor routing keys provide for each Braille cell, 6 navigation keys and keyboard with 8 Braille points. It also has a joystick and four function keys. VarioConnect connects to the mobile device via Bluetooth or USB interface. Leave the mobile device in your pocket while you control it totally with VarioConnects keyboard and joystick. The remarkable duration of the battery for 30 hours via Bluetooth and even over 100 hours via USB gives you totally freedom and mobility. Charging the battery is performed in less than 2.5 hours. Alternatively you can charge VarioConnect via USB. The robust casing is made of light metal. Such techniques are found in the body of modern cameras are already used for Pronto. This allows us to build very elegant, stable and robust equipment. 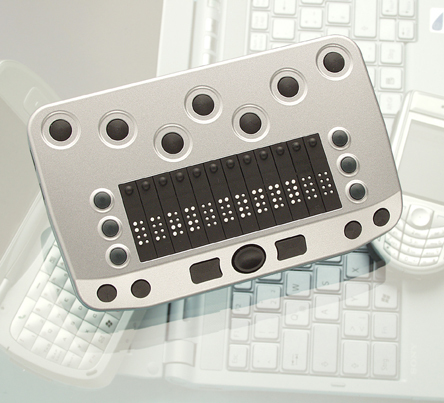 Mobile Braille display with 24, 32 or 40 cells for universal connection to mobile phones running Symbian and TALKS or Mobile Speak, PDAs running Windows CE and Mobile Speak Pocket or Pocket HAL (available soon) or laptops running Windows XP Service Pack 2 and screen readers like VIRGO, Jaws or Window Eyes. Function keys: three keys on both the right and the left side of the Braille display, two function keys on the left and right side. Eight input Braille keys, two ergonomic placed space keys, a joystick. One cursor routing key above each Braille cell. Screen readers: depending on the mobile device: VIRGO, Talks, Mobile Speak, Mobile Speak Pocket, Pocket HAL, Blindows, Jaws etc. Battery duration: about 30 hours Bluetooth, 100 hours USB. Charging time: 2.5 hours using the cable supplied with the device. (it can also be charged via USB).